A quarter of the way through this bowl of MacBaren Virginia Blend in a slight bend rusticated 1979 Savinelli Estella 310 poker with a brown pearl acrylic stem. The last of this sample of D&R Vengeur in a 1977 straight black rusticated Sir Brent billiard with a silver band repair and a brown pearl grey acrylic stem. Greetings from Greece, unfortunately today we have clouds plus light rain here in Athens. DTM Take It Easy - Ferretti Meerschaum Lined [new mouthpiece added]. 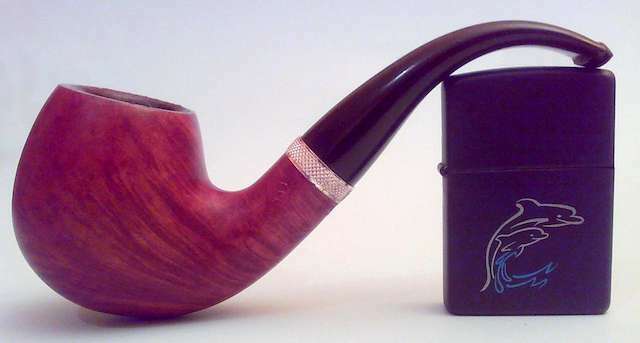 Just finished smoking Edward G. Robinson's Pipe Blend in a 2014 Basil Meadows smooth slight bend squashed tomato with an aluminum band and a black pearl acrylic stem. A can of Hansen's Mandarin Lime soda made with pure cane sugar is my drink. Part way through this bowl of C&D Red Carpet in a medium bend 1983 Ascorti New Dear KS with a black acrylic stem. The last of my open stash of MacBaren Symphony in a 1999 smooth dark brown full bend Tim West tomato with a black acrylic stem. A bottle of Cheerwine is my drink. Part way through this bowl of GLP Jack Knife RR in a smooth medium bend post-WW2 Pre-Republic Peterson Shamrock Killarney 9BC with a sterling silver band and a black vulcanite stem. Now smoking Sutliff Lord Fairfax in a 2003 medium bent Ural meer with a lined and etched egg shaped bowl with a brown pearl acrylic stem. Ice water and bergs is my evening drink. 2012 Rolando’s Own in a smooth straight early ‘60s Lane era “William Conrad” Charatan Executive Extra Large stretch apple with diagonal channel cuts on the lower right and left of the bowl along with a black vulcanite double comfort stem. Peretti Cuban Mixture in a 2016 Peretti's M.T. Natural made in Holland straight smooth brown Algerian briar billiard with a black vulcanite stem. MacB Navy Flake in the trusty '15 Tinsky POTY after work. Good stuff! Now onto some aged 5100 in the humble Stanny Legend 19, which is dedicated to this blend. G.L. Pease Fillmore in a BriarWorks Handmade dark blast squashed bent apple with green/blue/black cumberland stem on my morning drive to work. Briarworks Country Lawyer in the same pipe later this afternoon. Half way through this bowl of MacBaren Burley London Blend in a 2015 three quarter bend two tone Chacom UPO Rouge squashed tomato with a black acrylic stem and shank. Just finished work and this bowl of Angler's Dream in a 2001 Karl Erik Ekstravagant A medium bend with a pointy bottom and a wide top with a black acrylic stem.